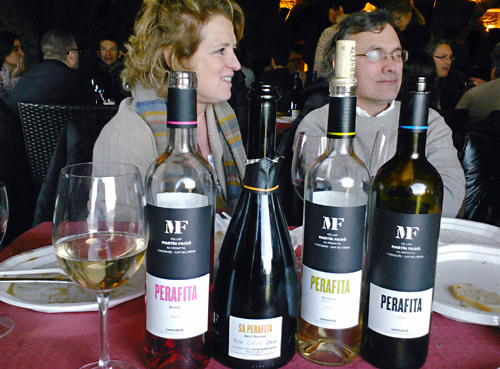 Starting last year, Cap de Creus’s Martin Faixó did something a little novel. As they had two restaurants in Cadaqués prior to opening their winery in 2007 they decided to hold an event that celebrated both their tasty endeavors, namely an Open Doors at the winery where people could taste their releases for that year as well as be served some incredibly delicious food that they made. Last year, due to timing, while researching our Empordà guide we only had a chance to taste the wines. This year, we made sure to rectify that past wrong and we carved out enough time to stay for the meal as well. While there was no cost, you had to register beforehand and it was obvious that word had spread after last year’s event as the pull of people was even greater. While tasting through their Rosé, Picapoll, Negre, and sparkling, Sa Perafita, they kept bringing out wonderfully tasty dishes like anchovies on pa amb tomata, escalivada, truita de patata, and more. Unfortunately, winter decided to make one last huge blast with crazy cold wind and so the arrós a la cassola they had originally wanted to cook had to be called off as it was impossible to make it outside. They more than made up for it though with “tossing together” a main dish of white beans and botifarra, but this was no ordinary meat and bean dish that you find in the region during the winter. No, they had killed the pig just two days previously and had made these delicious sausages themselves. They were flat-out the best botifarras we have ever had (and we are quite the botifarra conoisseurs, we might add). The insanely gregarious Martin Faixó family busied about the room, greeting people, serving dishes, wine, and making sure that everyone had a great time–they’re amazing hosts. The day rolled on and they took everyone outside for a barrel rolling contest, the winners of which each got to take home a case of Martin Faixó wines. We left with bellies full and an amazingly new appreciation of their bubbly Sa Perafita wine (which isn’t officially a Cava). We don’t know when the Open Doors for 2014 will happen, but we’re already planning to attend.